Zybez RuneScape Community was shut down on September 17th, 2018. You're viewing an archive of this page from 2018-12-03 at 12:09. Thank you all for your support! Please get in touch via the Curse help desk if you need any support using this archive. 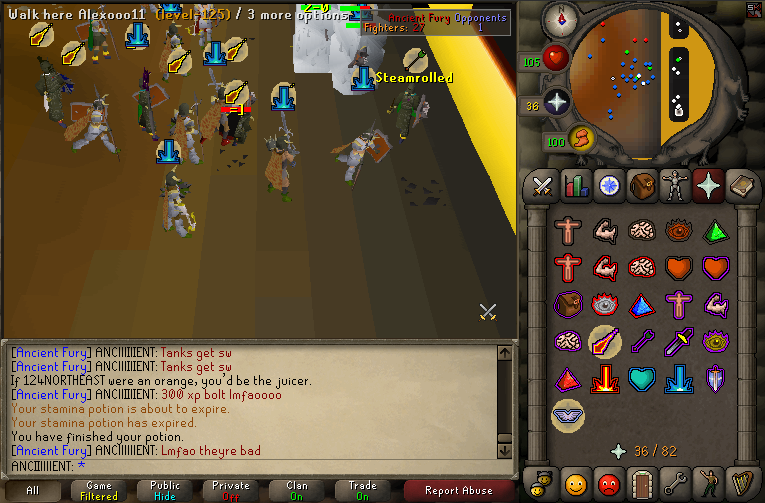 Biggest fight of the clan cup was always going to be the P2P Full out, in the build up to the fight it was given extra edge with the fights (Or lack of them some days) we've had with Rot in the wildy recently. Getting legends such as Steven and Ant on for the fight, we were pumped. Ant of course gave a speech, it might of had about 500 in-side jokes that only 12 of us got but it got us all in the mood. 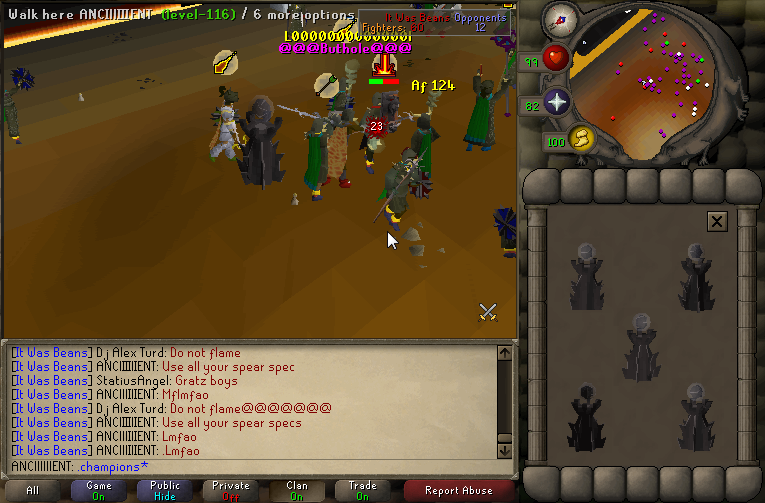 After the Full out Victory vs Rot we were pumped for the next fight which was the 30v30 P2P, a few of our pre-picked 30 people didn't fight because of dc'ing in the full out but we still had a very good team out there. Rot will say (And already have) that the extra person made all the difference but it really didn't. It was still 30-22 (Ish) until Toensi1 dc'd, our mass freezers were amazing, Rot could barely get any piles going and if they did we were just able to run away and we cruised to an easy win. After our previous Two fights we were confident going into this one and did pretty good again. Not gonna lie i can't remember what happened but i didn't die so ye i was why we won. 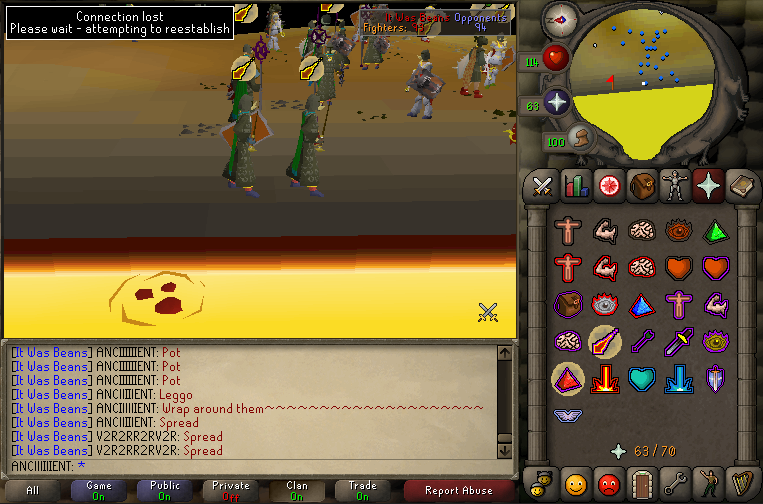 After this we had the Two F2P fights vs Rot. In the 30v30 F2P we did poorly and lost 24-0 (Left at 19-0). We did better in the 20v20 but lost 9-0, (After spending like 10 minutes trying to kill a 125 with 7 people who some how didn't manage to stinking die). Disappointing but we didn't expect to get to the final in any F2P category so we're pleased with how we did. Edited by Hawkeyorigin, 09 August 2014 - 5:49 PM. The best of the best, gz AF. Edited by Evf, 09 August 2014 - 5:54 PM. 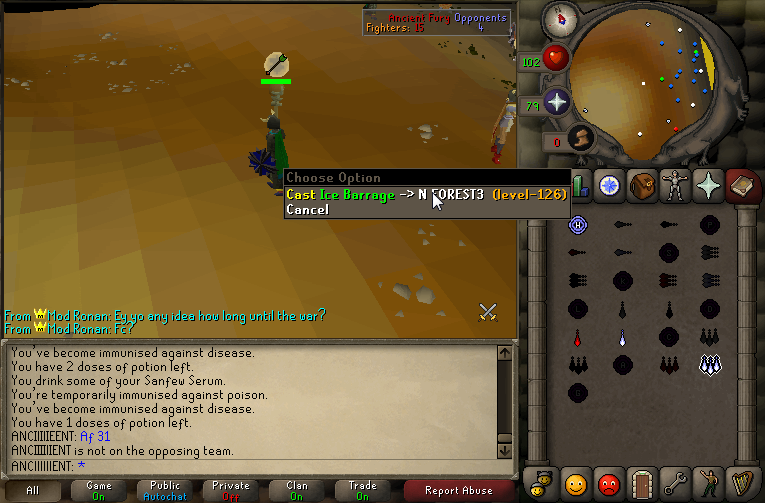 ROT has kicked two of its most dedicated members because of these fights. "We shouldn't be giving AF any action, next time just f*****g rag them." "Don't fight AF on even numbers they are better than us"
"Hurry up someone call ROT we need them to 1 item fast!" "Why don't ROT let us in their ts during fights when they invite us to help them?" A lot of fun, will look forward to winning again next year! Well done AF, very enjoyable fights to watch!